I know I’ve been a bit fixated on warm breakfast foods lately—probably because of the chill in the air. These scones are so seasonal that I had to keep up the breakfast trend for one more post! 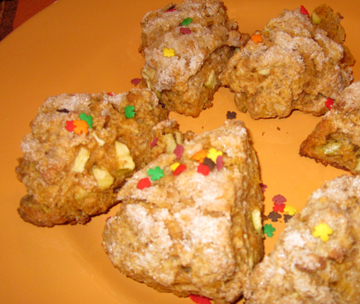 I have seldom met a scone I didn’t like, but even to my sconophilic taste these are special. You can taste and feel everything in them—the apples, the pumpkin, the spices, and of course the butter. Combine the sugar, flour, baking powder, salt, and spices. Cut in the butter, but be careful not to overmix. Stir the apple pieces into this mixture. In a separate bowl, thoroughly combine the pumpkin, cider, egg, and vanilla. Add this mixture to the dry mixture and blend just to moisten the dry ingreidents. They won’t ACTUALLY get completely moist at first. Transfer the ragged dough to a board, and knead it a few times to make the ingredients start to hold together. Shape it into 1 or 2 slightly flattened rounds (1 for large scones; 2 for small). Using a serrated knife, cut each round into 6 or 8 pieces. Place the wedges of dough (your future scones) on a cookie sheet covered with a silicone baking mat. Allow the sheet to cool in the freezer for 1/2 hour. While it is cooling preheat the oven to 375 degrees. Remove the scones from the freezer, sprinkle sugar generously over them, and bake them for 15 to 18 minutes, until they are a nice golden brown on the bottom. Makes 6 to 16 scones, depending on size. This entry was posted on Friday, November 12th, 2010 at 4:00 am	and is filed under Apples and Cider, Breads, Muffins, and Scones, Pumpkins and Squash. You can follow any responses to this entry through the RSS 2.0 feed. You can leave a response, or trackback from your own site. Tinky – Do you pronounce them scones (rhyming with ‘cons’) or scones, as in cones? Either way, I love them. 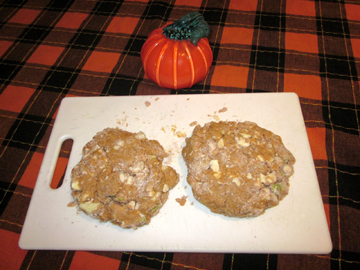 I’m going to try your recipe as it sounds perfect* for the cool, rainy, leaf-bringing-down day we are having in SW IA. * With a hot cuppa’ tea, of course. P.S. I can tell by the sprinkles Michael had a hand in these. I love how you say it makes 6 to 16 – I would probably just make two (one for now and one for later!!) If only you could come to visit – one of the local coffee shops has the most wonderful scones, both sweet and savoury! There is always room for more warm breakfast food in winter. I too, love a scone. 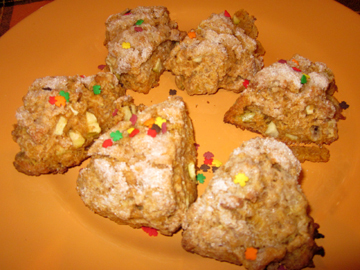 And Apple-Pumpkin Scones sound delicious!!! Thanks Tinky! Hi tinky ! You got a beautiful blog with fabulous recipes. Am happy to visit here.